Alternatively you can simply call 07917 052624 and we will be more than pleased to take your call. Single items or collections will also be considered. Full mount African Lions by Carl Akeley. This shows the level of detail in the manakins and also the posed sculptures used for reference. 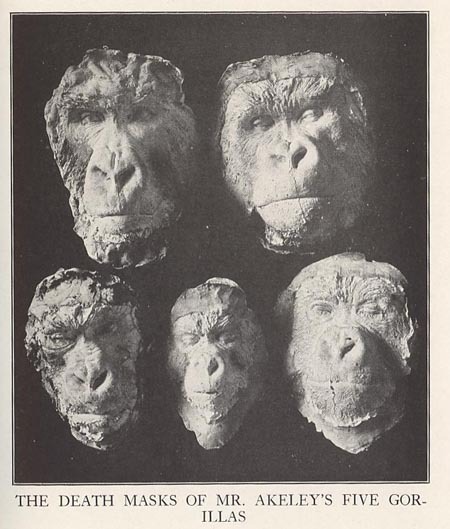 The models were made of clay at the time, unlike the methods used today. This would make a fantastic framed print. In the fall of 1883 at the age of 19, he decided to widen his interests in the field of taxidermy. Over in the nearby town of Brockport there was an Englishman by the name of David Bruce whose hobby it was to do taxidermy. Akeley went to see Bruce thinking that he may be hired to work in his painter and decorator business, as it had not dawned upon him that someone might actually earn a living from taxidermy, but instead Bruce advised a young Akeley to apply for a job with the famous Wards Natural Science Establishment in Rochester New York. 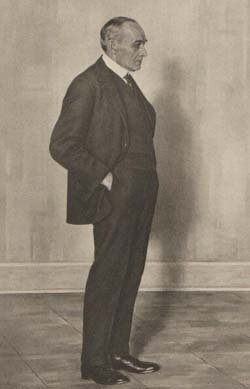 Akeley followed that advice and was subsequently hired by the owner, Professor Henry J Ward at the starting salary of $3.50 a week. 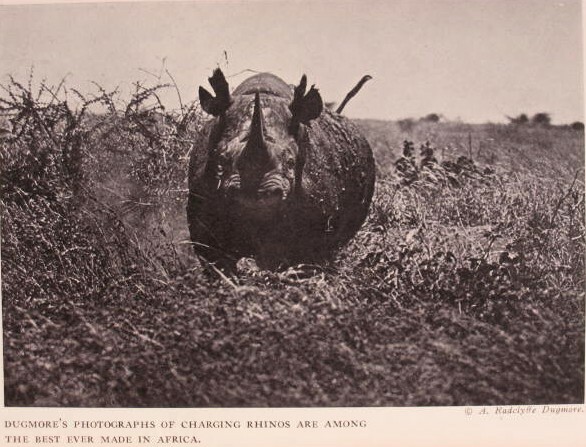 African trip, a picture of a charging Rhino. Given the lack of quality camera lenses when this picture was taken, it was a brave man to get that close. This animal would have been close, very close! 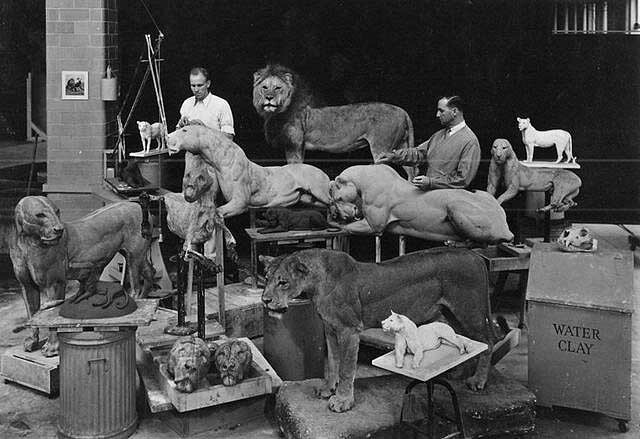 The art of taxidermy as practiced at Wards was very simple by any standards, yet typical of the era. To stuff an animal the skin would first be treated with salt, alum and arsenical soap, the bones wired and wrapped and put back inside the legs, and once hung upside down, the skin literally stuffed with straw until it could hold no more. To thin the body at any point, the skin would be sewn through with a long needle and the hide drawn in. Other shapes or contours would be achieved of this 'upholstered' specimen, simply by beating the detail into the mount with a plank of wood. Akeley left this establishment briefly for a period of six months to work with New York taxidermist John Wallace following a misunderstanding that led to his dismissal from Wards. 'A more dreary six months l never had spent anywhere' described Akerleys time at Wallaces Taxidermy of New York. So when Henry Ward came after Carl declaring that his dismissal had all been an erroneous mistake, he happily returned to his former employer and stayed a further 3 years. But Carl found little inspiration at Wards. He was critical that much of the work lacked any anatomical accuracy and that there was little attempt by the establishment to put the animals into natural attitudes. North American Beavers by Carl Akeley. Grouping was unheard of and habitat or 'accessories' as it was called, was seldom considered in conjunction with the mount. For an occupation that he had chosen because of its stimulation of a man's soul in the arts and science, he found little if any of these virtues present in the commercial application. During that time, Carl not content with the current methods of mammal taxidermy began to experiment with those of his own and he was soon able to develop procedures of big-game taxidermy that were to revolutionize the process and standards of taxidermy to come. 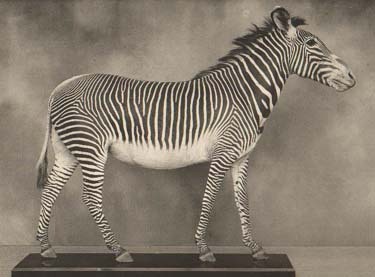 On one occasion when an opportunity to trial large mammal carcass casting techniques presented itself in the form of a life-size zebra, he set about skinning and molding the body in his own time, a process that took him from evening to dawn to complete. He managed to remove the entire skin through one incision to the belly and smaller cuts to the lower legs. Nevertheless the following day he found that someone had opened the zebra skin up entirely and in due course it was mounted in the old way and his casts thrown out onto the dump. Offered an opportunity to further his education through the courtesy of a former employee to Wards now teaching at a High School in Milwaukee, Akerley left Wards and took a position in the Museum to support his educational expenses. It became the turning point of Carl's career where over the eight years that he worked at the museum he was able put into practice many of the ideas he had theorized over during his tenure at Wards. African Zebras within the "African Hall" at The Natural History Museum in New York. 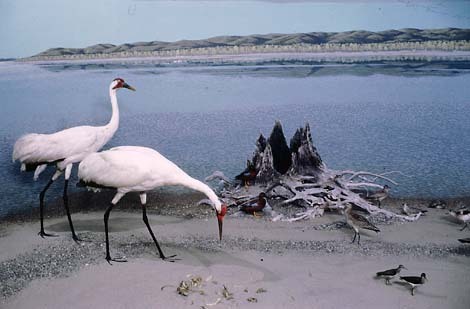 North American Sandhill Cranes by Carl Akeley. 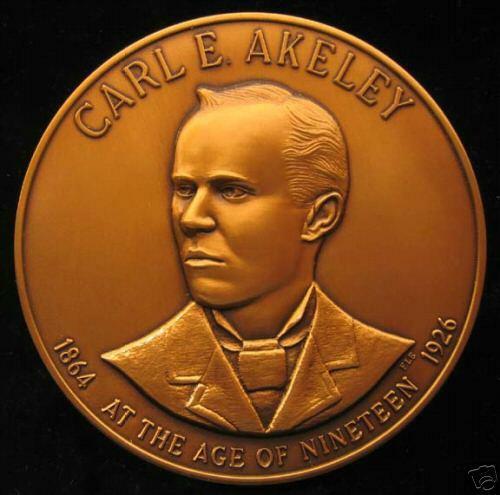 Commerative Medal of Carl Akeley. 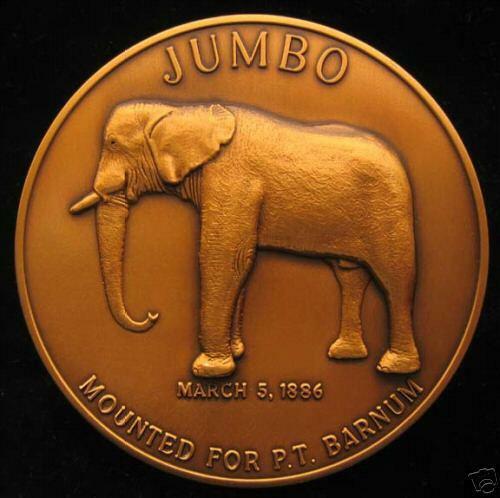 Commerative Medal of Carl Akeley, created for PT Barnum dated 1886. During his time at the museum, Carl not content with the method employed of straw, rag and bone stuffing began to experiment in the production of lightweight, detailed manikins through sculpturing and casting processes. His first project involved the portrayal of a Laplander driving a caribou sled over the snow. This fairly successful project was followed up by another exhibit involving Orangutans collected in Borneo. Overall, they made a good deal of progress in this process at the museum. 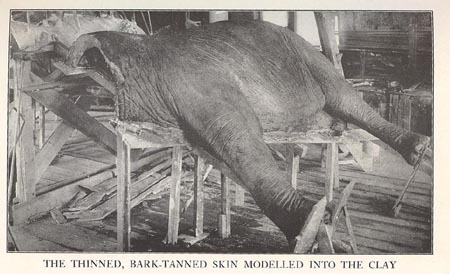 In making these groups, Carl abandoned the ways of the old stuffer and set about to make realistic manikins over which to stretch an animal's skin. Whilst sculpturing had been developed for many years through the art of bronze casting, manikin making was a new technique and had to be created comparatively quickly by very few people. 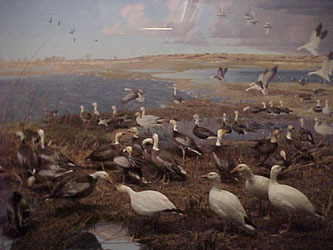 Akerley continued to work out new and more modern methods in taxidermy while at the Milwaukee Public museum and is credited with designing and constructing what is known as a habitat group during his tenure. He remained with the museum for eight years then another twist of fate changed the course of his life. Due to his outstanding work in both taxidermy and museum exhibit's, he was offered a position with the British Museum in London. He accepted and on his way there decided to stop off in Chicago for a visit to the Field Museum of Natural History, which had only recently been founded. In the Museum of Natural History in NYC the Akeley Hall of African Mammals is considered by many to be among the world's greatest museum displays. A monument to an area that has dramatically changed, the Hall is also a monument to Carl Akeley, the innovator who created it. 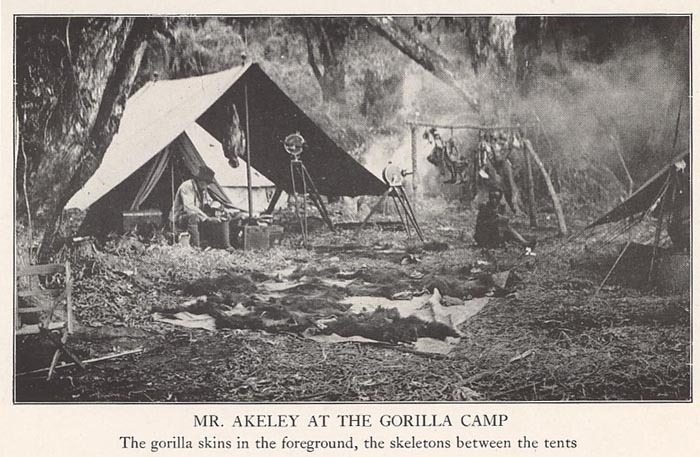 Akeley was a dedicated explorer, taxidermist, sculptor, and photographer who led teams of scientists and artists on several expeditions to Africa during the first two decades of this century. There, he and his colleagues carefully studied, catalogued, and collected the plants and animals that even then were disappearing. 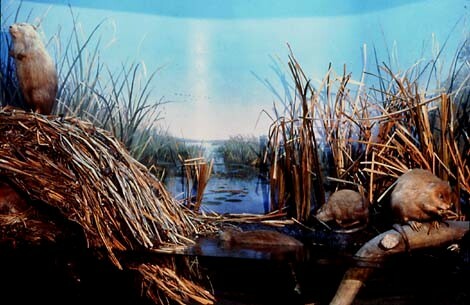 He brought many specimens of that world back to the Museum, where he created this hall, with its twenty-eight dioramas. Hanging Leopard with the description of how it met its end. 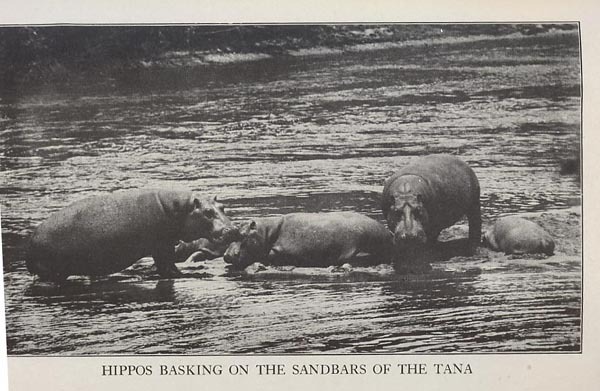 African trips 1905-09 to gather specimens for both The Chicago. 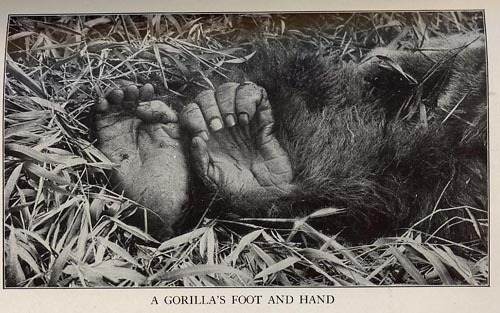 Gorilla hands and feet. 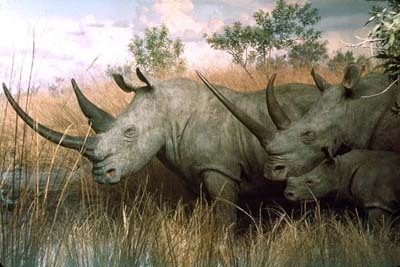 Whilst he was at the Field Museum, the officials hearing of the offer made by the British museum offered him a much better contract and the opportunity to go on expedition to Africa to secure specimens. He accepted on the spot. 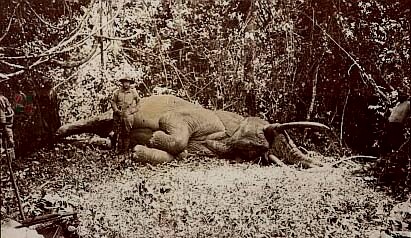 African Elephant Shot by Theodore Roosevelt 1910. Carl Ethan Akeley was determined to raise taxidermy to the level of "high" art. 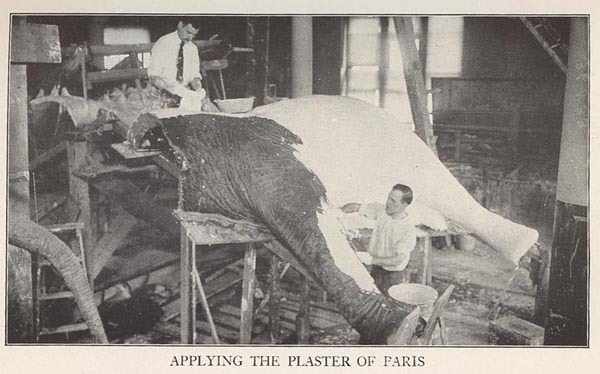 Working at the American Museum of Natural History, he began to model clay maquettes to create accurate life-sized animal dioramas. In the process, he began to bring taxidermy to new heights. With the encouragement of financier J. P. Morgan and the famed sculptor Alexander Phimster Proctor, he cast the first of the little clay groups into bronze in 1913. That first work was Wounded Comrade, a cast of which is in the NMWA collection. 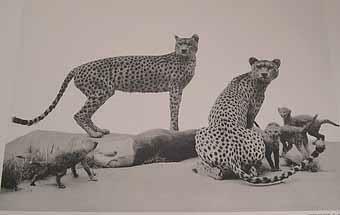 �Kneeling on the leopard�s stomach and holding the forelegs apart with his elbows, the gasping taxidermist loosened his grip on the animal�s throat for a short breathing-spell. Almost immediately, he marked a flash of new light in the glaring golden eyes, and the battle went on as before, man against beast, brain and muscle against brute force.� Thus did C. E. Akerley, an unarmed taxidermist on a zoological expedition to British Somaliland in 1898, beat the stuffing out of a ferocious African leopard. Akerley had been bitten and clawed to shreds before he finally succeeded in throttling the enraged carnivore. 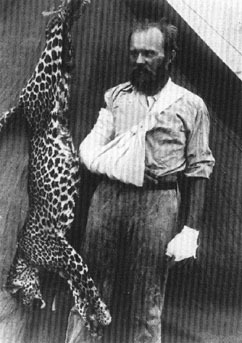 �The big cat�s body grew limp, and for the first time in history one of great jungle felines succumbed in fair fight to a weaponless man.� Akerley was photographed, his arms in bandages, standing alongside the strangled leopard; he eyes his former adversary with deep suspicion, as if the animal might yet return to life, and bite his head off. 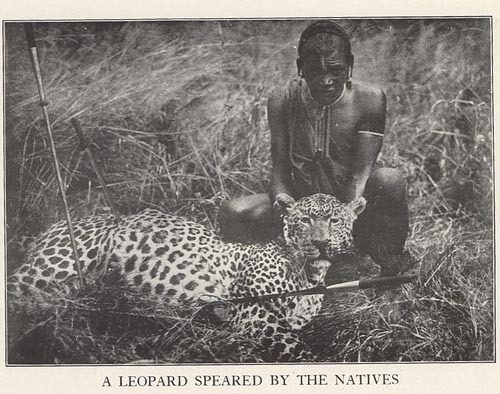 Akerley�s historic bout with the Somali leopard is just one of many similar accounts of male bravado that appeared in the pages of The Wide World, a magazine of true adventures for men, which flourished between 1898 and 1965. Hanging Leopard with the description above of how it met its end. African trip with a freshly collected Mountain Gorilla. 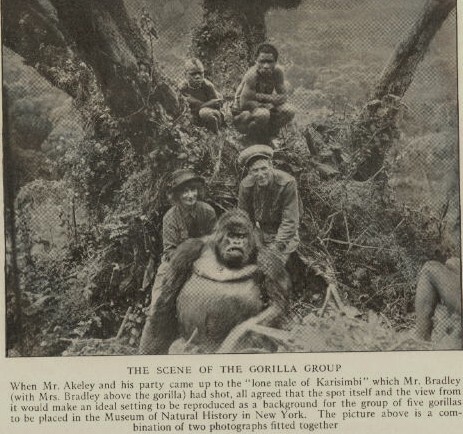 African trip with perhaps one of the earliest images of Mountain Gorillas. 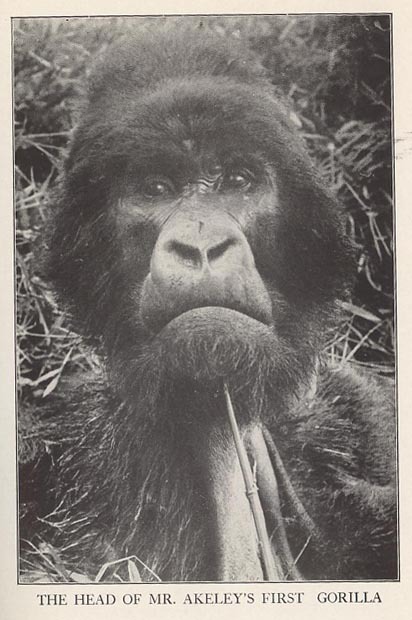 Descritpiton of the above capture for secientific study, taken from Akeley's book hunting for Gorillas in Africa. Akeley became a teacher of such important wildlife artists as sculptors James L. Clark, Robert Rockwell, and Louis Jonas. 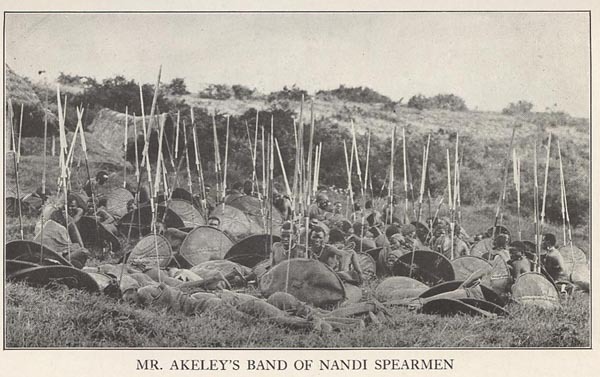 Although widely known, Akeley�s work is not widely held because it is rare - he did not create many sculptures. 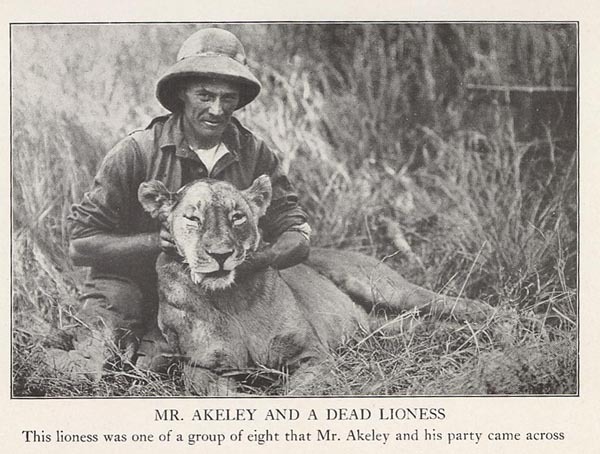 Akeley died in 1926 on a wildlife expedition to the Congo. Field notes and map of African trip dated 1921. 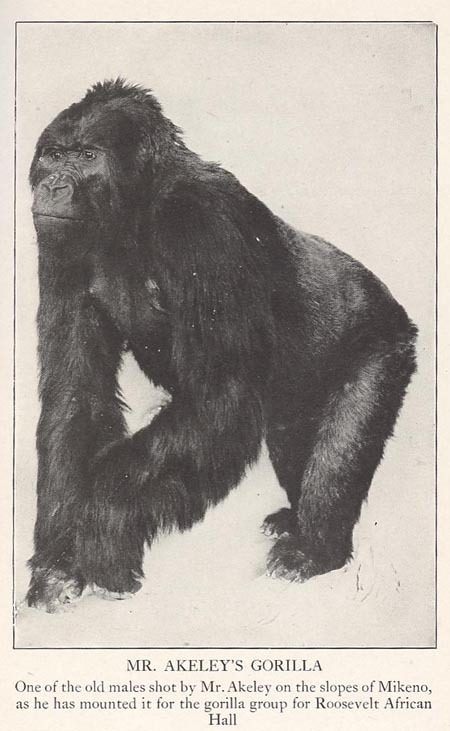 It is interesting to notes that not until 1853 did western eyes see a Mountain Gorilla. 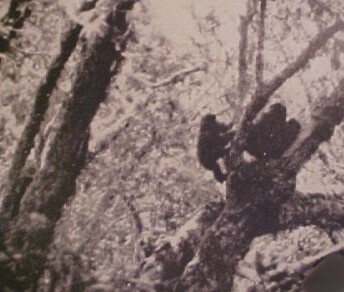 It is understood that Akeley was the first man to capture moving images of these Apes. 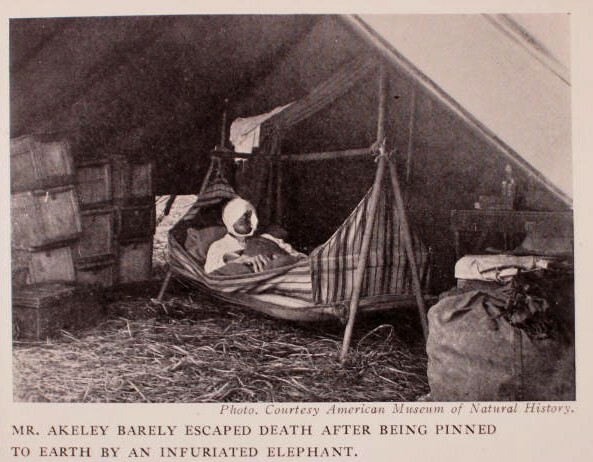 Akeley lost his life on a similar trip to the Congo in 1926. African Elephant being prepared in the field. 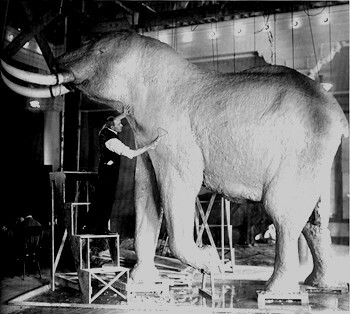 African Elephant being prepared for The Natural History Museum in New York, 1914. African Elephant Hall, The Natural History Museum in New York. 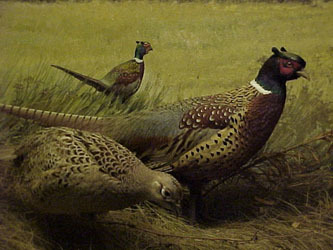 Ring Necked Pheasants by Carl Akeley. While in Africa, George Eastman (Founder of the Kodak Company) met with Carl Akeley, a naturalist and taxidermist from the United States. 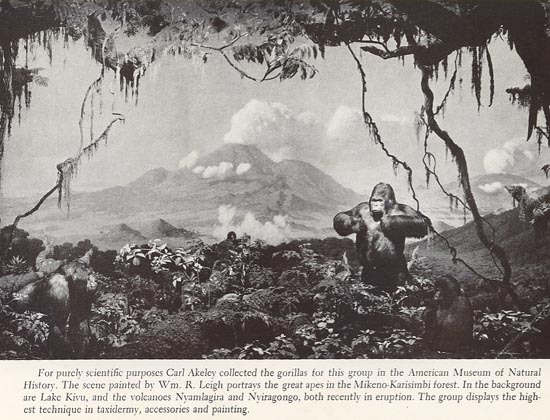 Akeley was collecting specimens to begin the African Hall for the American Museum of Natural History in New York City. These meetings secured the inclusion of donations from Eastman�s safari for the museum�s collections. 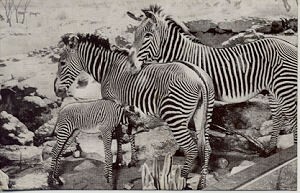 Eastman went on a second safari, up the Nile to Uganda, in 1928. On this trip, he bagged two of his most highly prized trophies, a white rhinoceros and an elephant. When he returned to Rochester, Eastman displayed the head of the elephant in the conservatory of his house. A replica is exhibited in its original location in the mansion. Eastman enjoyed his many traveling adventures. After he returned from his second trip to Africa however, he was diagnosed with a progressive and irreversible spinal disease. On March 14, 1932, Eastman ended his own life. In a note to friends, Eastman wrote, �My work is done. Why wait?� African 1929 the tomb of Carl Akerley. Mikeno. 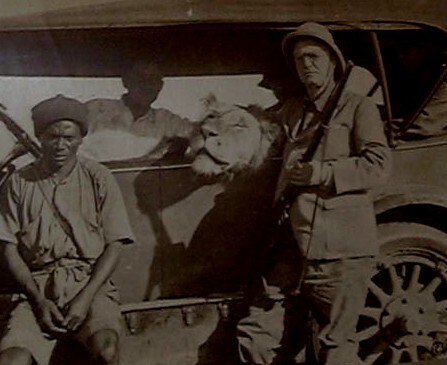 Mrs Akerley is standing on the left with guide Mguru, who had helped Akerley on previous expiditions in Africa. British explorer and hunter, was born in London on the 31st of December 1851, and was educated at Rugby and in Germany. 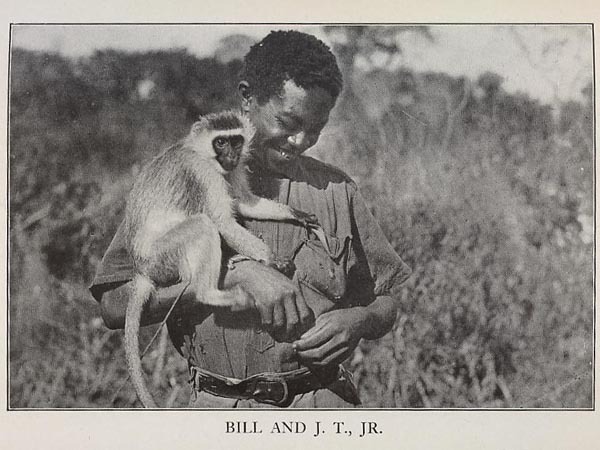 His love for natural history led to the resolve to study the ways of wild animals in their native haunts. Going to South Africa when he was nineteen he travelled from the Cape to Matabeleland, reached early in 1872, and was granted permission by Lobengula to shoot game anywhere in his dominions. 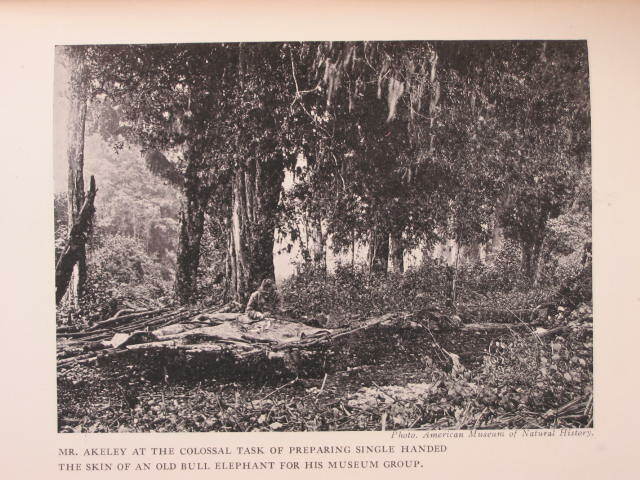 From that date until 1890, with a few brief intervals spent in England, Selous hunted and explored over the then little-known regions north of the Transvaal and south of the Congo basin, shooting elephants, and collecting specimens of all kinds for museums and private collections. His travels added largely to the knowledge of the country now known as Rhodesia. 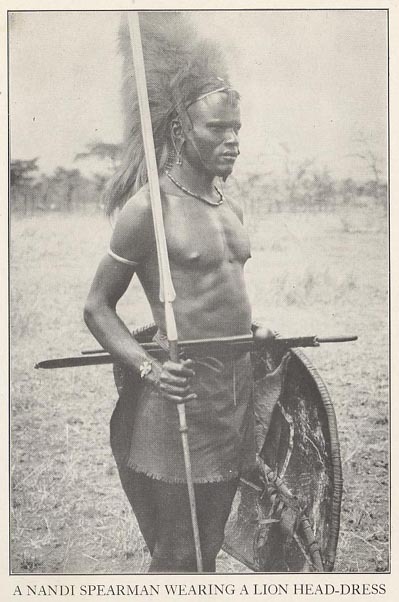 He made valuable ethnological investigations, and throughout his wanderings - often among people who had never previously seen a white man - he maintained cordial relations with the Kaffir chiefs and tribes, winning their confidence and esteem, notably so in the case of Lobengula. In 1890 Selous entered the service of the British South Africa Company, acting as guide to the pioneer expedition to Mashonaland. Over 400 m. of road were constructed through a country of forest, mountain and swamp, and in two and a half months Selous took the column safely to its destination. He then went east to Manica, concluding arrangements there which brought the country under British control. Coming to England in December 1892 he was awarded the Founder's medal of the Royal Geographical Society "in recognition of his extensive explorations and surveys," of which he gave a summary in "Twenty Years in Zambesia" (Geo. Journ. vol. i., 1893). 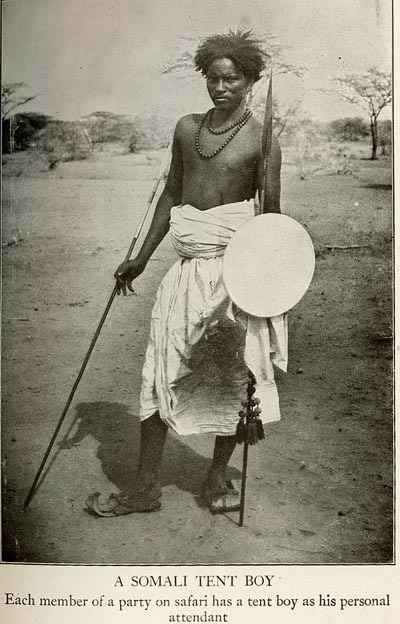 He returned to Africa to take part in the first Matabele War (1893), being wounded during the advance on Bulawayo. 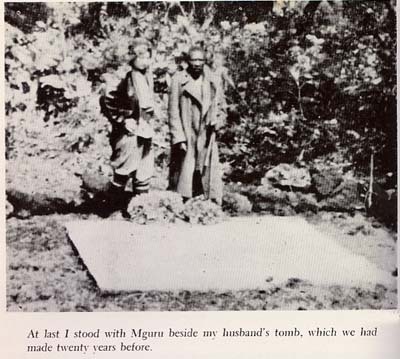 While back in England he married, but in March 1896 was again settled with his wife on an estate in Matabeleland when the native rebellion broke out. 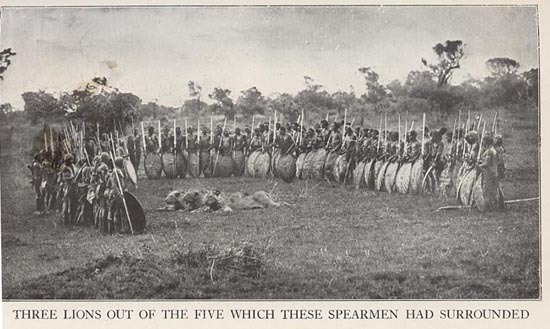 He took a prominent part in the fighting which followed, and published an account of the campaign entitled Sunshine and Storm in Rhodesia (1896). On the restoration of peace Selous settled in England. He continued, however, to make shooting and hunting expeditions - visiting Asia Minor, Newfoundland, the Canadian Rockies and other parts of the world. In none of his expeditions was his object the making of a "big bag," but as a hunter-naturalist and slayer of great game he ranks with the most famous of the world's sportsmen. 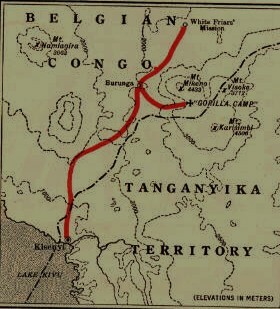 Contrary to popular belief, Selous did not lead Theodore Roosevelt�s 1909 expedition to British East Africa, the Congo and Egypt. 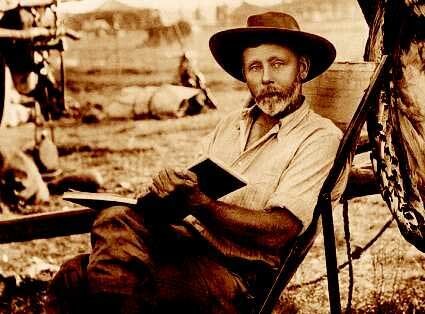 While Selous was a member of this expedition from time to time and helped organize the logistics of the safari, it was in fact led by R. J. Cunninghame. This was possibly the largest safari ever, with a retinue of some 300 people. The official purpose of the expedition was to collect specimens for the Smithsonian Institution. 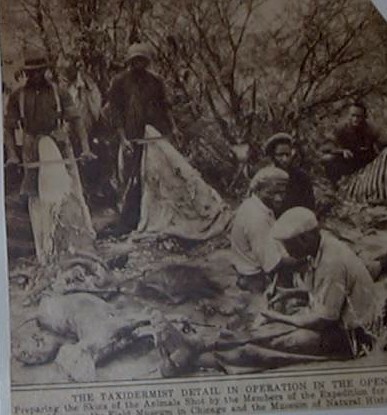 During the trip, Roosevelt and his son Kermit shot over 500 animals. 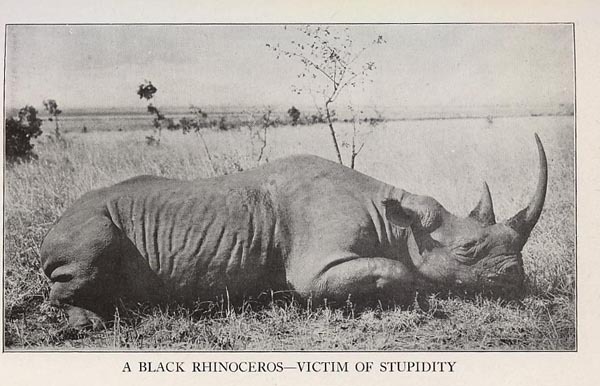 Roosevelt wrote of Selous; Mr. Selous is the last of the big game hunters of Southern Africa; the last of the mighty hunters whose experience lay in the greatest hunting ground which this world has seen since civilised man has appeared herein. 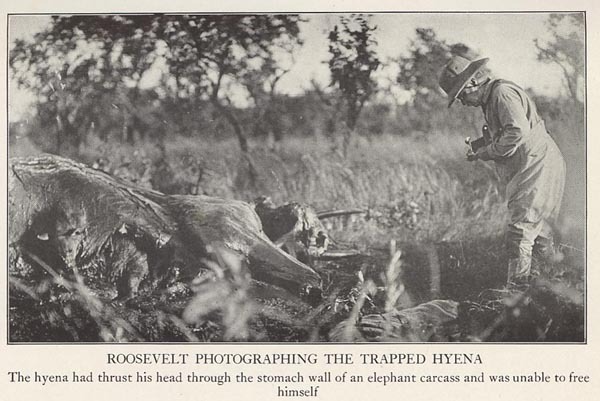 On his return Roosevelt published an account of the adventure in his 1910 book African Game Trails. 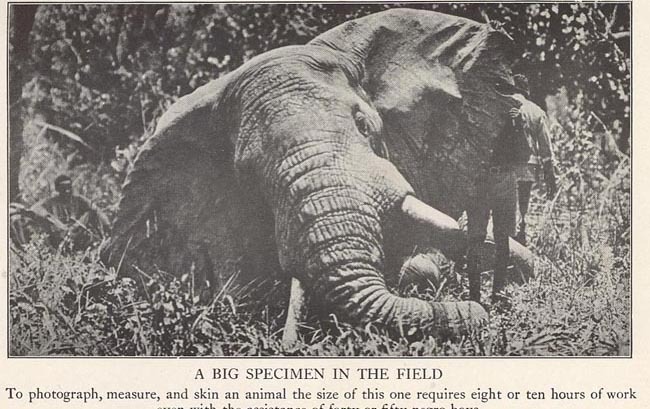 Selous was one of the first conservationists. 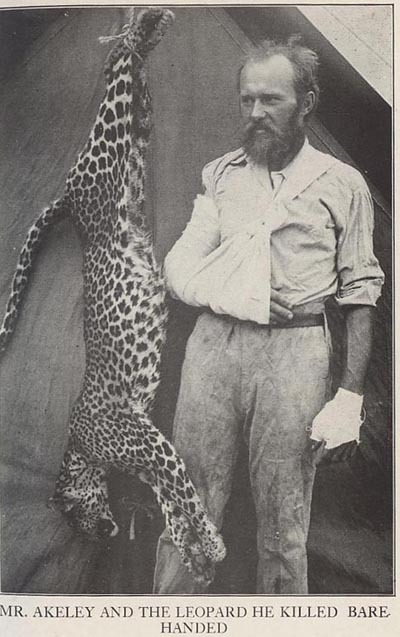 In none of his expeditions was his object the making of a big bag, but as a hunter-naturalist and slayer of great game he ranked with the most famous of the worlds sportsmen. 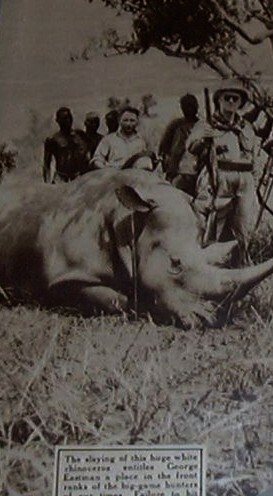 In leading so many hunting expeditions, Selous noticed over time how the impact of European hunters was leading to a significant reduction in the amount of game available in Africa. 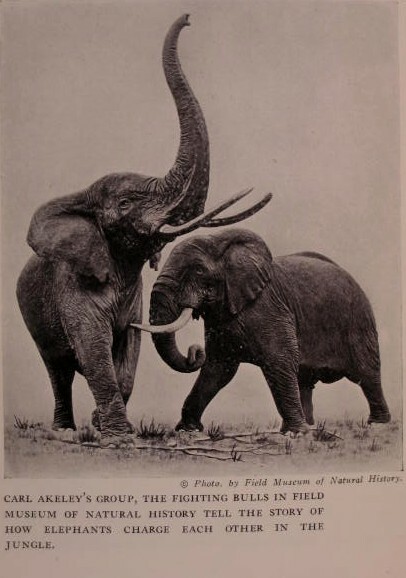 In 1881 he returned to Britain for a while, saying; Every year elephants were becoming scarcer and wilder south of the Zambezi, so that it had become impossible to make a living by hunting at all. The Selous Game Reserve in southeastern Tanzania is a hunting reserve named in his honor. Establish in 1922, it covers an area of more than 17 000 m� (44 800 km�) along the river the Kilombero, Ruaha, and Rufiji. The area first became a hunting reserve in 1905, although it is rarely visited by humans due to the strong presence of the Tsetse fly. In 1982 it was designated a UNESCO World Heritage Site due to the diversity of its wildlife and undisturbed nature. 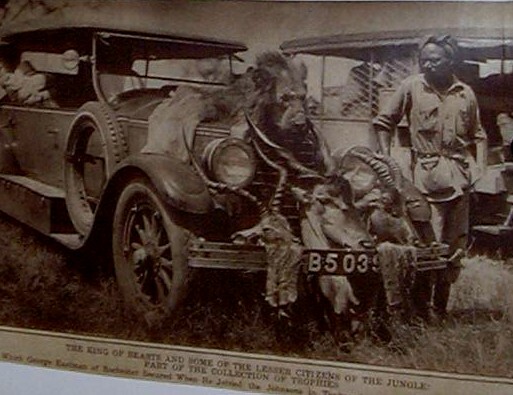 His personal collection of African trophies, created by Rowland Ward was donated by his wife in 1919 to The Bitish Natural History Museum.